Smoking shisha in Cairo is as intrinsic to Cairene street culture as walking along the Nile in the evening, or drinking fresh sugar cane juice and playing backgammon at a favourite ahwa. All over the city, there are a thousand different tobacco flavours to be enjoyed in a thousand different settings. 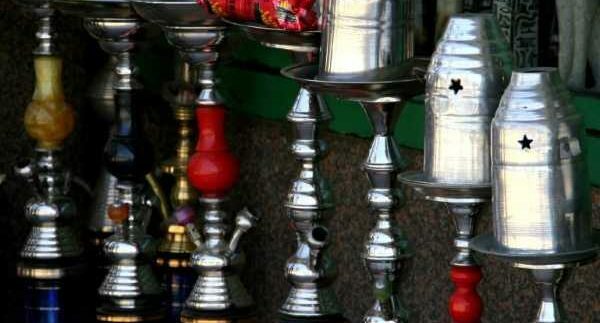 Whether you’re looking for a baladi experience in a downtown alleyway or for consistently good shisha to enjoy with a cold beer, everything you need to know about finding the perfect shisha for you in Cairo is here. Smoking a shisha in one of Downtown Cairo’s historic ahwas (or street cafés) is a one-of-a-kind, authentic Cairene experience. For those who haven’t noticed, shisha in Wust El Balad is a lifestyle. A quick stroll around and you’ll notice that everyone from bawabs in front of their buildings to shop owners lounging outside their doors are all smoking shishas in the street. To get your own piece of the action, visit popular downtown ahwas like Borsa, Taka’eba or Bustan. The shisha isn’t the greatest tasting at these street cafés, but it’s more about the shisha experience itself. For the best shisha under 5LE in the city, try one of the ahwa bursas in the Bahela Passageway between Bab El-Louk and Talaat Harb Street. Top it off with a hot tea with fresh mint or a local cold drink like karkadeh, zabadi or a fresh juice. Unfortunately, many ahwas downtown don’t always use fresh tobacco, and few of them clean their shishas properly. However, if you’re an adventurous one looking for an authentic downtown experience, this is your chance. Bring a book, an iPod filled with baladi music or something else to amuse yourself with while you soak up the downtown atmosphere. Pretty soon, you’ll know everyone’s name and they’ll bring your order before they even make it to your table. Sometimes, the regular flavours of apple, cantaloupe and maasal just don’t do the trick. So why not venture into new, exciting flavours that make extraordinary shishas? With locations in Downtown, Zamalek and Heliopolis, Pottery Café carries El Fakher (Arabic for Premium) brand that offers the freshest tobacco and lends itself to the delicious shishas bursting with flavour. Pottery Café makes a delicious coconut shisha. Shisha costs around 10LE (including the lay). Premium shisha flavours go for a bit more. Widely considered the best shisha Downtown, Arabesque on Kasr El Eini Street in Garden City offers exciting flavours like premium grape and guava, which is highly recommended. Expect to pay around 15LE for your shisha, including the lay. Bonus points for Arabesque for also providing Cairo’s most delicious fruit drinks. Fresh juices are available in any cocktail you desire, including some exotic fruit drinks like kiwi juice. There also seems to be a budding artist in the kitchen, because their fruit drinks are always served with pieces of fresh food shaped like faces, hearts and clouds. Just under El Nozha Street in Heliopolis, Fiji makes a fantastic shisha. For their most interesting house flavour, try their Chicklets shisha that mixes mint and strawberry tobaccos. The best part is that they put fresh ingredients in the water too, like freshly squeezed lemons and lots of fresh mint. If budget isn’t an issue and you don’t mind the 100LE minimum, Sequoia offers the greatest variety of shisha in Cairo. Simply ask the waiter for the shisha menu and you’ll be presented with a plate of over fifty little sampler containers of shisha tobacco that you can smell and choose from! Besides, if you’re lucky enough to get a seat by the Nile, reach a meditative state gazing at the Nile and smoking a cappuccino shisha. Expect to pay around 25LE per shisha. For times when the city gets too stressful, Villa 55 in Maadi, Nomad in Dokki (above King Hotel) and Alle Botti in Heliopolis are great open-air spaces where one can rely on consistently good shisha and a cold beer. If it’s more of a wine evening, head over to Taboula in Garden City. Other than their selection of wine and shisha, the food is also fantastic! Sometimes nothing quite beats the comfort of a home-made shisha, where all variables, including coal, can be made to your heart’s desire. Unfortunately, there seems to be a major drought of places to buy fresh shisha tobacco brands from. Khan El Khalili Market has some affordable options, but Spinney’s in Citystars offers the greatest variety of brands and flavours in the city, including exotic flavours like banana, bubble gum, espresso and pomegranate. Disclaimer: Cairo360 does not encourage shisha smoking. This is simply a guide for shisha lovers looking to expand their horizons.